There were about 3,000 patrons and 182 employees at the club the night of the fire. Singer and actor John Davidson was getting ready to perform in the Caberet Room. There was an award ceremony going on in another part of the club, a wedding reception in the Zebra Room, and the other bars and restaurants in the club were full of people also. 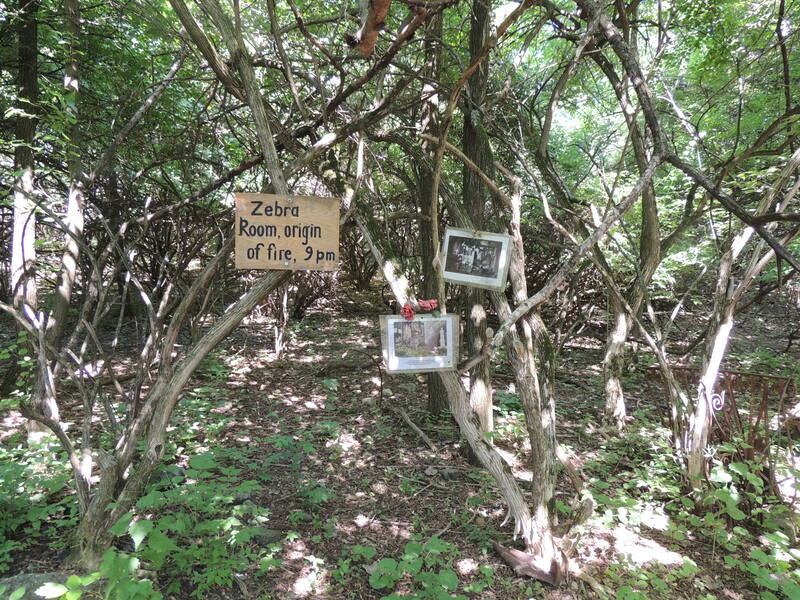 It seems the fire started in the Zebra room, and was discovered around 9:00. The fire department showed up within a few minutes, but the fire spread too quickly, and was consuming the building before it could be completely evacuated. The bodies of those that couldn’t be evacuated were later found piled up by the main entrance. Firefighters concentrated on the Cabaret Room where it was known that many people were trapped, but at midnight the roof had collapsed, and authorities doubted any more survivors would be found. Faulty wiring was later determined to have been the cause, but a number of other things played a part in the outcome. Overcrowding, inadequate exits, locked exits, lack of sprinklers, and no fire walls being some of them. There was also allegations of arson, but these were never proved. We actually spoke with Shirley Baker, an employee who was working the Zebra room that night, and she insists the fire was arson, even claiming to have been threatened over the years in order to keep her quiet about what she saw that day. True or not, she had some interesting stories. Take I-471 south, take exit 2 at Alexandria Pike. Turn left, and Beverly Hills Drive is up a bit on the right. Normally, no. The site is off limits, though usually open to the public once a year for the anniversary memorial service. I Always wondered if there was activity inside that Medical Building. We have been up on the site many times,and they are there. We have a group, The Beverly Hills Supper Club Fire, a Facebook group. We have been trying to get an On-Site Memorial at the Cabaret Showroom area,where the victims died. I am a relative of one of the victims of this fire, I am trying to find out who owns the land now and how to get a hold of them, I would like to get permission to go up to the site, if any one can help me please contact me at b42207868@gmail.com, I remember that night vividly but have never gone there for closure, it seems funny but I think now it is time. They took all the bodies to the Armory in Ft. Thomas because there were so many, so there’s almost two parts to this story. The Armory is certainly haunted. I remember as a kid playing basketball up there, if you went to the (usually) dark end where the drink machines were you would get unexplainably terrified, like someone was literally at your back. Or cold chills shooting down your spine for no reason. The basement or first floor is even creepier, lots of little dingy concrete rooms. Some people swear they can hear pipes rattling, voices, footsteps coming down the corridor, etc. At night people have seen shadows walking in the windows of the upper floor where the basketball courts are (and the bodies were taken). Growing up in Ft. Thomas, and having parents who vividly remember the Fire (they were supposed to be there that night for my dad’s 21st birthday which was May 28, 1977 but got in late from college) you quickly learned all the legends, hauntings, and myths surrounding the fire and the following events. I live by it and go up all the time. I have had terrifying sights and feelings, but I honestly can’t say it was real. What I can say is that this place is considered haunted by everyone I talk to. Part of it is all the physical evidence still left over, but still if you believe in ghosts you would definitely call it haunted. I am a sensitive and have trekked upon the site of the old supper club more times than I should have. I can tell you with absolute certainty that the land harbors an enormous amount of spirit energy. I’m clairaudient and have heard the residual sounds of dance music and the din of party goers. I have also sensed numerous intelligent trapped souls, that I “spoke” to, on the site, who are fearful of walking into the light. It is very, very disheartening to sense the frustration of these trapped souls. I made attempts to help accend into the light, but their fear is inhibiting their progression into eternal peace. I just finished reading a very good book about the tragedy. So many unanswered questions still remain. I would imagine that after such a horrific incident the grounds would most certainly harbor the spirits of those who perished. It’s heartbreaking. What is the name of the book? I would like to read it. Thanks! One of my friends moved into a house a short walk from the BHSC a few years ago, and we visited late at night. We didn’t stay long, because anyone in touch with their inner senses can feel fear and anxiety overcome them. It’s as though the spirits are still pleading for help, and they probably are. One of the guys that went with us explained lighting a fire up there is asking for trouble. The spirits get angry, restless, and you’ll start to hear screams from the victims as though they are reliving the nightmare. My father was a volunteer firefighter for the nky area, and he was one of the respondors to this incident. He didnt talk about it. It’s an experience that leaves emotional scars. Just finished a very informative book that questions the arson theory. The Beverly Hills Supper Club The Untold Story Behind…. by Robert Webster. Not surprised about the Mafia influence preceding 1977 and even afterwards. Well researched and very interesting.